Significant developments are occurring in standardization efforts supporting industrial robot safety worldwide. In July 2011, the International Standardization Organization (ISO) published the new edition of ISO 10218-1:2011, covering safety requirements for industrial robots, and the all new ISO 10218-2, addressing industrial-robot systems and integration. Based on the safety tenants from the current ANSI/RIA R15.06-1999 and CAN/CSA Z434-2003 standards, these new international standards provide a comprehensive update in safety thought, requirements and new capabilities. The Robotic Industries Association (RIA) and the Canadian Standards Association now are cooperating to publish a single harmonized standard for the United States and Canada. This work is ongoing through the respective technical committees for robot safety of each association. The new standard—ANSI/RIA R15.06 in the United States and CAN/CSA Z434 in Canada—will be a “four-in-one” document that includes ISO 10218-1:2011, ISO 10218-2:2011, and the unique requirements of both countries, all in a single document. The new standard will be significantly more comprehensive than the current editions, and will introduce some exciting new technical capabilities for robots and robot systems that did not exist or were not feasible when the current editions were written. The document has been rewritten and reorganized, but all of the basic safety requirements from R15.06 and Z434 that metalformers have worked with for years now are global requirements. Also, currently compliant installations remain compliant with no need to make changes, until a manufacturer wishes to either take advantage of new features or modify or move an existing robotic cell. The new robot-safety standard requires a risk assessment be performed when designing and integrating new robot systems, and assigns responsibilities for them. It includes considerably more detail on what is expected with a risk assessment and what considerations must be included. Photo courtesy ABB Robotics. So what has changed? If I had to pick just one notable change, it would be how risk assessment is handled. The new standard requires a risk assessment be performed when designing and integrating new robot systems, and assigns responsibilities for them. It includes considerably more detail on what is expected with a risk assessment and what considerations must be included. This is a direct acknowledgement that it is not possible in a standard to offer prescribed safeguarding requirements for every possible robot-system design. Every robot system is different, and the detailed requirements of the system must be individually reviewed. Through a comprehensive risk assessment, the proper safeguarding requirements can be determined and implemented to ensure personnel safety in the workplace. Safety-rated soft axis and space limiting allows positive control of the robot location, and thus provides for the safety of the worker. It allows areas in the robot’s restricted space to be designated inclusive or exclusive, by limiting the motion of the robot. Case studies featuring robot systems using this technology, presented at RIA’s annual National Robot Safety Conference, have suggested floor-space savings on the order of 30 percent and cost savings of $125,000 per robot system. Collaborative robot operation reintroduces the “man-in-the-loop” in the production cycle of robot system operation. The current standard eliminated a feature called continuous attended operation, considered unsafe with the level of safety technology and sensors back when the standard was written. However, the last 10-plus years have seen a dramatic increase in safety technology, machine control and safety-rated software. I had the pleasure, last March, of assisting in demonstrating the application of collaborative robot operation at the RIA booth at the Automate 2011 show in Chicago. In addition to improving productivity, the collaborative operation practice promises to reduce fixture costs, while also improving the level of safety provided to the worker. International standards are written to address requirements of the product manufacturers and suppliers, which includes requirements for “information for use.” This information is intended to be instructions and guidance for the safe use of the machinery, but it is not written in “normative” form to the user of the equipment. We typically claim that U.S. and Canadian standards also are written to the “user,” and believe that is the case with the current R15.06 and Z434. 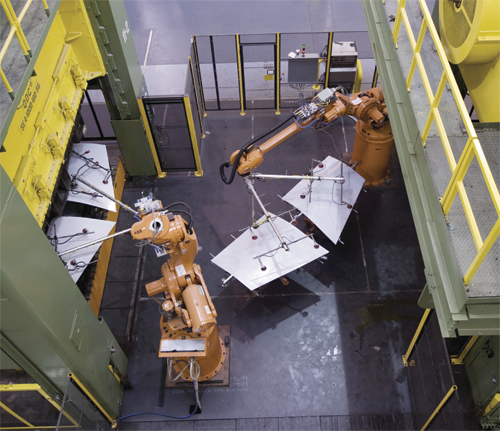 Moreover, we believe that assigning responsibilities to stakeholders at all levels of involvement with an industrial robot system—the robot manufacturer and supplier, safety-component supplier, integrator, installer and the user—ensures that the end user will receive the support needed to provide for a safe and productive industrial-robot workcell. The two associations’ technical committees are working to ensure that the new standard contains the appropriate requirements, assigning responsibilities to the user to actually follow the instructions provided by the robot-system manufacturer and supplier, in order to develop good work practices and training programs for the operators. The committees also are busy updating and including the annexes from the current R15.06 and Z434 standards.